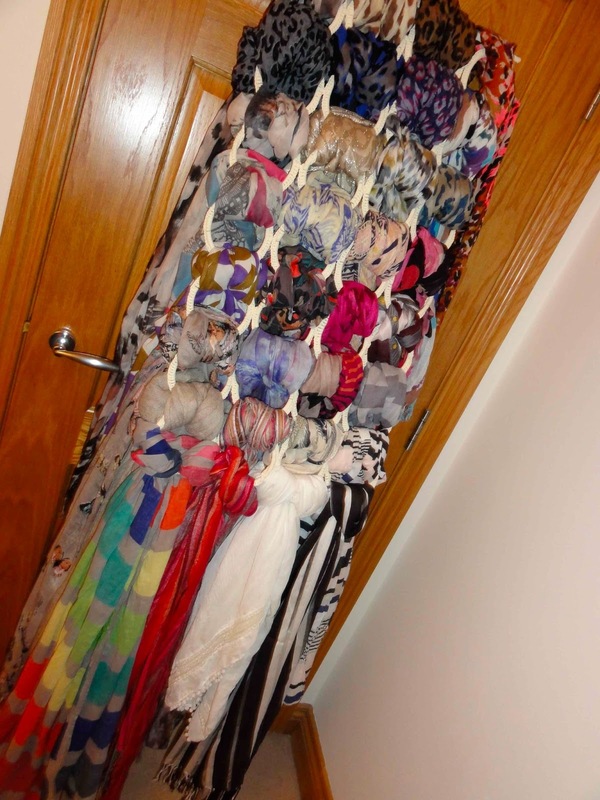 Now that I'm selling scarves, a few people have contacted me asking about scarf storage. Where do I keep all the scarves I own...that constantly growing collection? 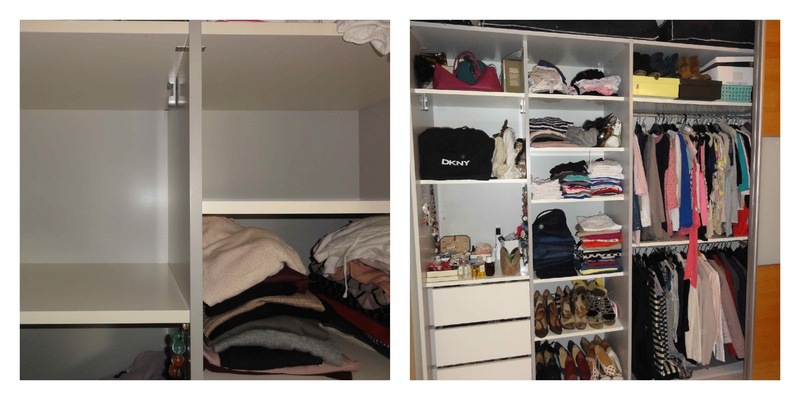 Up until recently, I folded them on two deep shelves in my wardrobe. 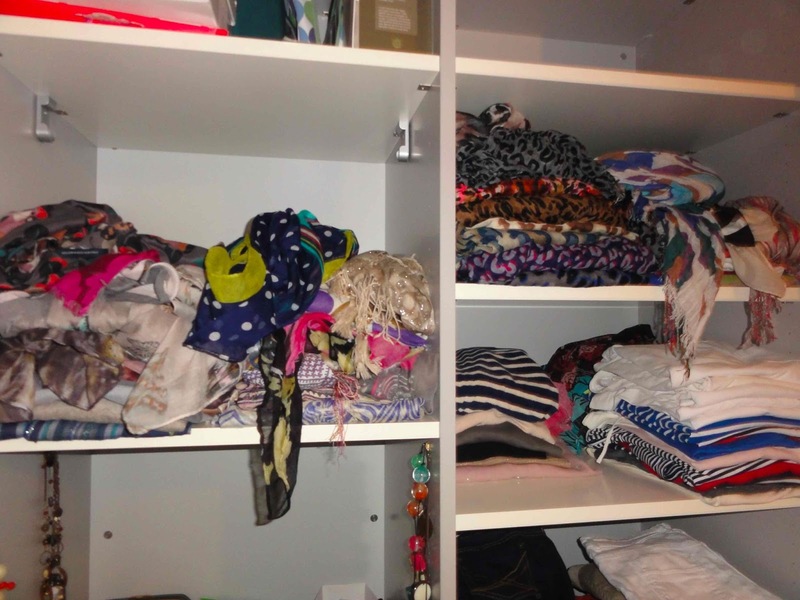 It worked ok but invariably, every few months, it would become a big messy pile of scarves all tossed in on top of each other and I could never find the one I wanted easily. So after some research online, I purchased one of these scarf holders at Ikea.. 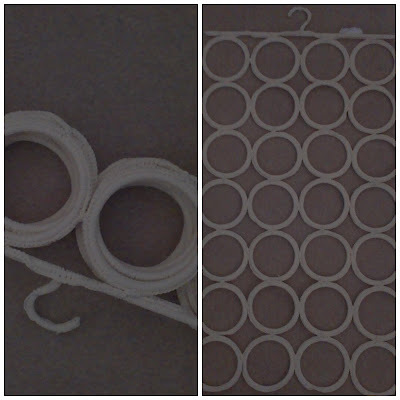 It's simply a series of hoops that have been woven together with a soft string that doesn't catch on the scarves. 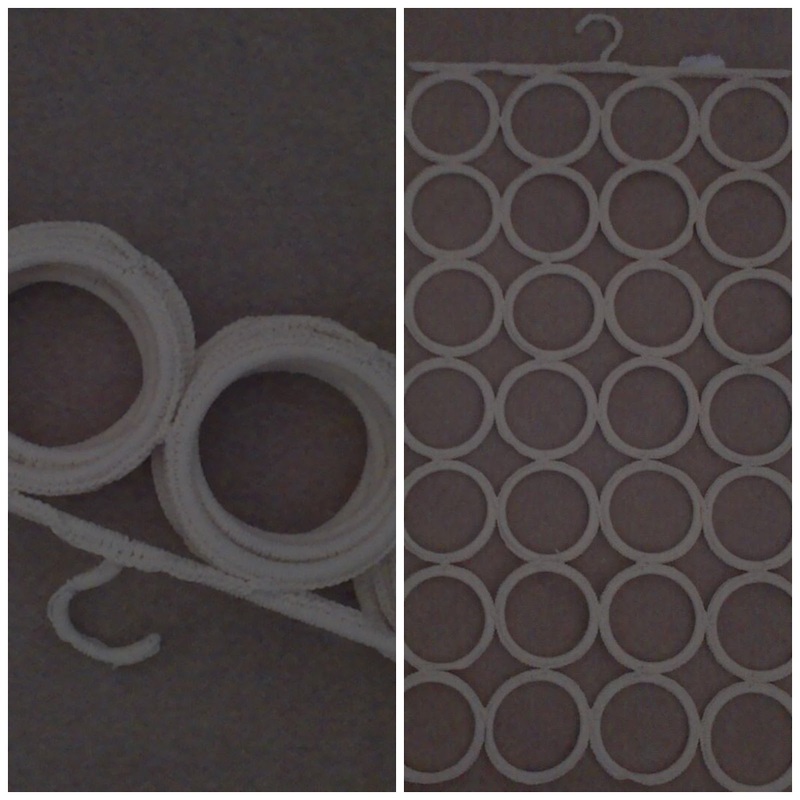 It folds down on top of itself as per the first picture and then opens up to hang as per the picture on the right. You loop one scarf on each loop and this is what you end up with.. This is holding 32 scarves - which was about the number I have. I did ditch 6 or 7 of them in the process of tidying my wardrobe. It is quite heavy once full and although it can hang in the wardrobe, for ease of use and for space reasons, I've hung mine on the back of the spare room bedroom door. 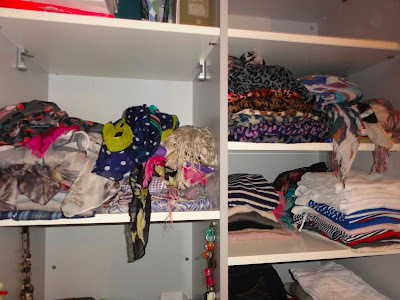 No more rummaging through a mess of scarves, I can now hold the scarves against what I'm wearing to find the perfect match - and I've found myself using scarves I've not worn in ages so it's a great way to utilise your collection. The upside to this is that I freed up two huge shelves in my wardrobe, allowing me to store my handbags here and create an extra shelf for shoes. Result! This scarf storage solution is available in Ikea but for anyone who doesn't have an Ikea near them or who (like me) find themselves spending £60 on Diam bars, plastic food bags and coloured napkins every time they go to Ikea for just one thing, I do have some for sale in the shop. To cover my costs (petrol, paypal and energy expended in Ikea hell), I have to sell them for £10..so obviously, if you have an Ikea down the road - go get one there! But if you don't, come get one in my shop by clicking on this link here. Just a note about pricing. My shop is set up to charge £2 postage for all the items in the store, regardless of weight or size. This scarf storage hanger costs more than that to post to addresses in the UK, therefore I've had to increase the item cost to £11 to cover this additional postage and to cover packaging & paypal costs. They are such cleaver ideas. I brought one from Wilkinson or Wilko depending where you live. It was as cheap as chips and works a treat. I have one but I don't fill it up to the brim as like you say, it's really heavy. I have a separate scarf drawer for the ones I fold up which don't get as much use. They are really good and if too heavy to hang on the back of a door - hang it up in the wardrobe just like you would another garment (that's where I keep mine). But they are useful! (Adopt tone of big bad wolf to Red Riding Hood) "And Avril, oh my - that's a stonkingly big collection of scarves you have!" Great post - LOVE IT!!!!!!!!!!!!!!!!!!!!!!!!!!!! RUNNING to buy one now! Snap I have one of these too it's great, don't know how I'd find any of my scarves otherwise. I spent £70 on storage that last time I went and totally forgot to buy the full length mirror I actually went for! But I love ikea, as I have to be on the ball with storage in our temporary living quarters. That's really nice, if you have a lot of collection then managing it difficult. But if you plan then it becomes easy as it becomes important to place and store each and every item at its proper place so that it becomes to find when want. So you have made proper storage solution for this.